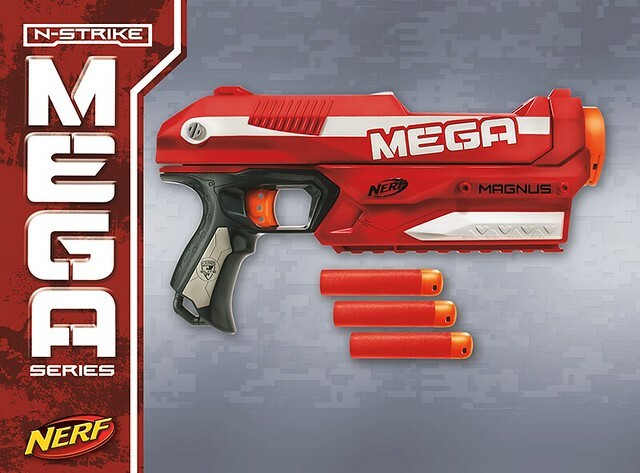 Yesterday Nerf posted the above image of the upcoming Nerf Magnus blaster. The caption below is what came with the image. COMING SOON! Put the power of the Nerf MEGA Centurion in the palm of your hand with the new Nerf MEGA Magnus! Share this image if you’re excited for more MEGA blasting! If you’ve been following this blog, you’ll know that the Magnus blaster was just waiting for some official confirmation. I have a feeling that this will come out in 2013. Stay tuned to this blog for more info on the blaster. This was also on Twitter. And did anyone else notice the pic said “N-Strike Mega” and not N-Strike Elite Mega? Would this be a good sidearm as this looks like a good replacement from my current sharpshot that I use with elite darts? It depends on how your game rules are. For some games, at least the ones I host, the Mega Centurion firing Mega Darts is a one hit KO. For other games they might not allow that. Overall the Mega Dart at the moment is flimsy, inaccurate, and very prone to tearing. The darts are also expensive. If I were you, I would just stick to your Sharp Shot. I’m thinking of getting a Blazin’ Bow (they have them at our local Walmart) and applying similar rules. The game we normally play requires players to freeze for 30 seconds after taking three hits within three minutes. I might make the arrows paralyze players for an additional 15 or 30 seconds, as well being out with one hit. What do you think? And if you have a Blazin’ Bow, what are your rules for it? If you’re looking to replace your Sharp Shot and want a blaster similar in function, get a Firestrike. It gets Elite ranges, uses Elite darts, and has dart holders in the front plus a light. Performance and size of this blaster can’t be evaluated because it is not being sold yet, however I think it would be quite large for a sidearm based on the length of the slide, the tactical rail, and the size of a Mega dart. When the Centurion came out, performances landed at about 50-70 feet flat. Based on that, the ranges of the Magnus, unfortunately, would probably be similar or even less than Elite ranges. I also think that the price is a bit high (see http://wp.me/pN6Hw-1e0), considering you can get a Firestrike for a little more than half that.